Well, here we are at the end of 2009. How many finished canvases do we have to show for ourselves? I am proud of the many “Nativity” Home Study participants who finished many pieces in time for the holidays. I am very pleased that I finished the Merry Christmas canvas, by & More, for my mother-in-law. I think she likes it! My resolution is to stitch more. (I can see my dbh rolling his eyes.) Yes, I stitch a lot. My wish for 2010 is to stitch a lot with other stitchers. 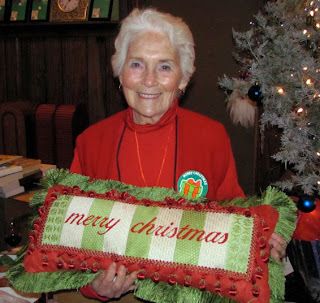 To that end, I am fortunate to be able to teach a class at Amy’s Golden Strand called Needlepoint Study Hall. I will be in the classroom at Amy’s store on Tuesdays from 10am to 1pm. So I hope some local stitchers can join me. (Please call ahead to make sure the class is being held as it can be bumped or rescheduled by a variety of events.) This is an especially good time for local “Halloweenies” Home Study participants to stitch together. But you are welcome to bring any canvas for advice or just stitching time. Have you signed up for a monthly canvas program from your local shop? There are many out there. Do you have any advice on keeping up with a monthly program that you could share with us? Along with Halloweenies I would love to complete a 12 Days of Christmas set I have had in my stash for a couple of years. Yes, very ambitious. Well, we at least need a plan! Yes, that means you too. Pull out some canvases from your stash and plan to finish some of them by a certain date in 2010. If you fall behind, revamp the plan. Don’t beat yourself up about it. Just move on. And ALWAYS have fun! Hi Everybody. 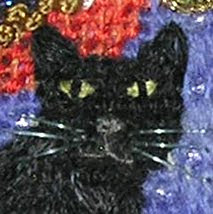 Robin here... Peggy has invited me to be a guest blogger on her Halloweenies Blog. How fun is that! I will be sharing some of my experiences as I teach Katt Z. Witch at the Long Beach TNNA Market in January. Just like a kid with a new toy... just found the section of Gadgets. Hmmm... which one to add? Love this Blog. Christmas is nearing, but we're thinking about Halloween. We are venturing in to the Blog world. These are exciting times! 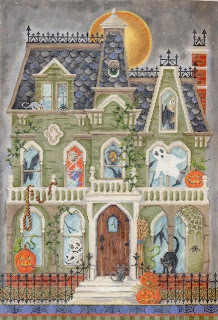 Our first project is the "Halloweenies," the newest Kelly Clark Needlepoint collection available to Needlepoint Shops in January 2010. Amy Bunger's next Home Study is the Halloweenies: a Haunted House and 8 Characters; beginning February 2010. You can read more about the Halloweenies Home Study release dates on Amy's website, www.amybunger.com. We will have photos showing our progress as we stitch. Any trouble shooting or helpful hints we discover? We will mention it in the Blog as well as in the Tips section. This will help us as much as it will help you. It's our Needlepoint Study Hall.